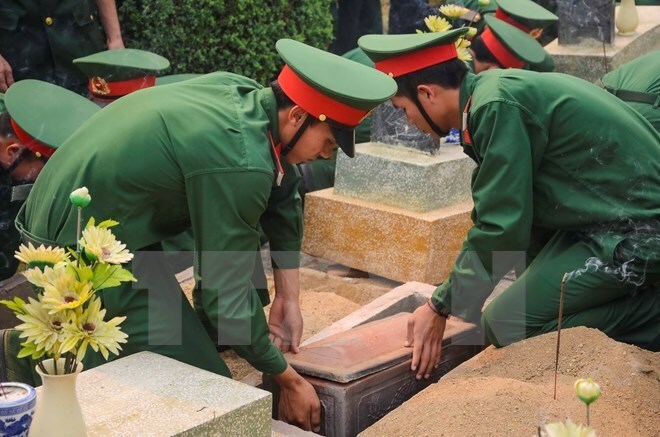 Thanh Hoa (VNA) – A ceremony was held on May 10 at a martyr cemetery in Ba Thuoc district of north-central Thanh Hoa province to rebury remains of Vietnamese volunteer soldiers and experts who died in Laos and Lao soldiers and students who died in Vietnam during wartime. Nineteen sets of remains of Vietnamese soldiers and experts found in Laos and six sets of Lao soldiers and students and one of the Vietnamese martyr collected across the country were laid to rest at the cemetery. The reburial ceremony aimed to honour the great contributions of the martyrs who sacrificed their lives to the national liberation cause and when undertaking international missions.